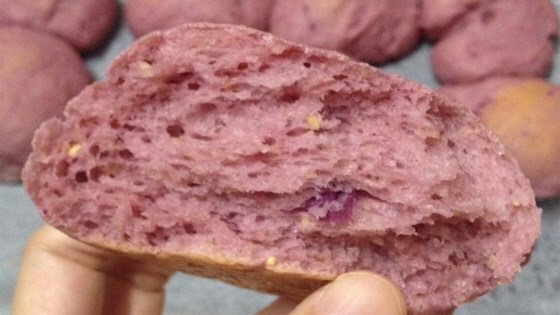 "This bread is super soft and also packed with nutrients. My whole family can't stop eating it." Mix bread flour, sweet potatoes, whole wheat flour, cake flour, eggs, brown sugar, water, butter, milk powder, yeast, and salt together in a bowl until dough holds together, adding more water if dough is too dry. Transfer dough to a floured surface and knead until smooth and elastic, 6 to 8 minutes. Place dough in an oiled bowl and cover with plastic wrap or a damp towel. Place bowl in a warm place and let sit until doubled in size, about 1 hour. Punch dough down and cut into 16 pieces, rolling them into balls. Place dough balls on oiled baking sheets, cover, and let rise until doubled in size, about 40 minutes. Preheat oven to 350 degrees F (175 degrees C). Remove cover from dough. Bake in the preheated oven until golden brown on top, 12 to 15 minutes. Any variety of sweet potato can be used in place of the purple. The dough can also be made in a bread machine on the "Dough" setting.